Let us all call upon the Lord Jesus Christ to protect the people affected by the enormous wild fire that has stricken their city. May He protect all the Fire Fighters, Military, Police, Medical Doctors, Health Care Givers, City officials and Christian Ministers at this trying time! Pray that His hand of Mercy will cause the situation to change in weather and wind. 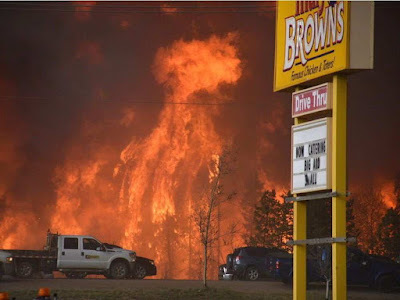 And may the people of Fort McMurray and those working in that vicinity be drawn closer to our Saviour Who knows all things and cares for us and works everything out according to His will.